I LOVE HORSES! I enjoy drama, being with animals, art and writing. Also I'm a Christian! Sorry I don't do F4F, I want to follow people because I like their work. Stuff. Go follow the people I'm following, they're all super cool. Follow my followers too. THAT IS AN ORDER!!!!!!!!! 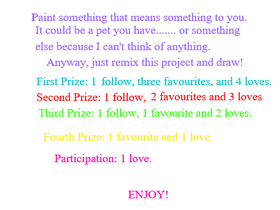 I need at least 10 more people to enter my art contest, PLEASE ENTER! Let's get 2,000 projects before 2020!